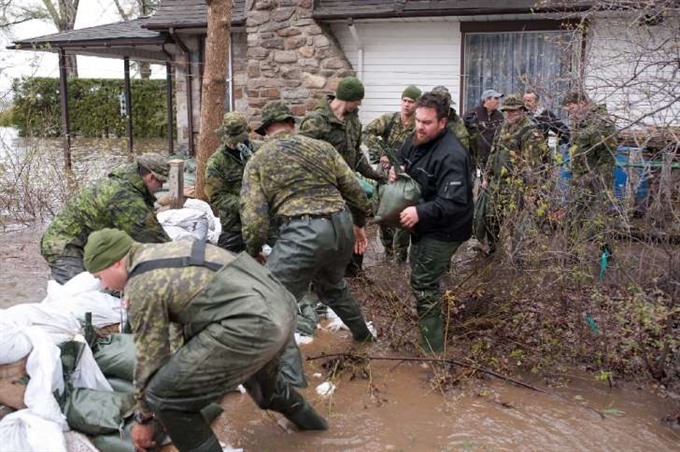 MONTREAL, Canada – With heavy rains persisting and waters still rising over much of waterlogged eastern Canada, the nation’s military on Sunday tripled the number of troops urgently working to evacuate thousands of residents. New evacuations were ordered in Pierrefonds, on the northwestern shore of the Island of Montreal, after three temporary dikes ruptured, quickly sending water levels higher. Montreal Mayor Denis Coderre declared a state of emergency for his city, particularly four western neighborhoods. That measure allows the city to order mandatory evacuations from threatened areas. "The next 48 hours will be decisive," Coderre told reporters. A combination of torrential rains and runoff from melting snow has caused rivers to overflow their banks from Ottawa to Montreal, posing critical challenges for people already exhausted by weeks of seemingly unending rainfall. More than 1,000 people have been evacuated in Quebec province, the largest number coming from Gatineau, near Ottawa, said a statement Sunday from the province’s emergency response unit. More than 2,000 homes have been flooded in 130 towns and cities, with authorities urging residents to evacuate before it is too late. The worst is yet to come, Quebec Premier Philippe Couillard warned. "The water will continue rising over the next two or three days," he said Saturday after visiting the town of Rigaud, west of Montreal, which has been flooded for more than a week. Water levels continued to rise across much of an area of some 500 kilometres (300 miles), from Toronto and Lake Ontario and stretching downstream along the St Lawrence River. The Ministry of Public Safety said waters were expected to crest sometime Monday in Quebec province. Some 450 troops had been dispatched by Saturday to help put sandbags in place and assist with evacuations. But that number was set to triple by the end of Sunday, including 500 in the immediate Montreal region, 400 in the area between Gatineau and Rigaud to the west, and more than 500 in the Trois-Rivieres region northeast of Montreal, said Lieutenant Colonel Pascal Larose. "Our troops are responding quickly and professionally and are already beginning to deliver critical support to Canadians affected by the flooding," Defense Minister Harjit Sajjan said. Emergency services said precipitation Sunday could reach 90 to 125 millimetres (3.5 to 5 inches) in some areas, and Environment Canada warned that "the ground, already near saturation, has little ability to absorb further rainfall." "Even shallow, fast-moving water across a road can sweep a vehicle or a person away," it said. "Don’t approach washouts near rivers, creeks and culverts." As of Sunday, Robert Robillard, a Pierrefonds resident, had yet to evacuate, despite the 10 to 15 centimeters of water in his basement. "I haven’t seen anything like this since 1974," he said, adding that the area now is much more crowded and thus vulnerable. In Rigaud, Mayor Hans Gruenwald ordered the mandatory evacuation of some 100 homes. 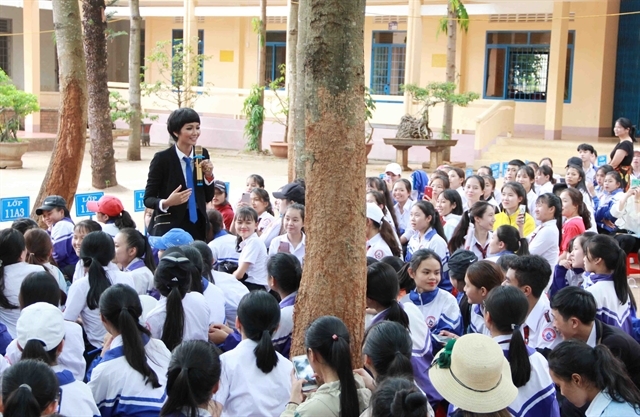 After three weeks of flooding, "our people no longer have the physical capacity or the morale, so I took the initiative to evacuate them," he told the LCN network. Floodwaters have made some 400 roads impassable, and several schools have announced they will be closed Monday. On the Atlantic coast, the New Brunswick Emergency Measures Organisation warned residents to remain on alert until Monday, saying water levels are near or above flood stage in many regions and expected to rise. "I understand people are reluctant to leave their homes," Couillard said, "but if you’re asked, do it for your own safety." Meanwhile, in British Columbia on the opposite side of the country, the same combination of rain and snow melt has caused flooding and mudslides that left at least two people missing, media reports said. Residents of several dozen homes were ordered to move to safety. Police with dog teams and swift-water technicians were searching for Clayton Cassidy, 59, the fire chief of the village of Cache Creek, who went missing Friday while checking water levels. A 76-year-old man was missing after a mudslide Saturday swept away his home in the community of Tappen, CBC reported. "It sounded like a freight train coming down the mountain," Tappen-Sunnybrae Fire Department Chief Kyle Schneider told the broadcaster.